Bullet lists make a sequence of important points easy to read. When those near-perfect little circles are vertically aligned, readers can quickly process the text. Yet too many bullet lists in an eLearning course or slide presentation can be repetitious and mind-numbing. Learners and audiences need novelty to maintain and sustain attention. The trick for going beyond bullets is to think visually. By sprinkling in alternatives to bullets here and there, your minimal use of bullets will be more effective. Here are six bullet alternatives you can create in any graphics program or in PowerPoint. 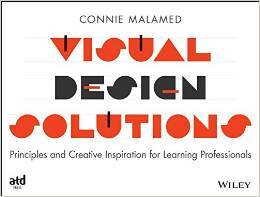 If you’re interested in more visual design ideas, see my book, Visual Design Solutions. 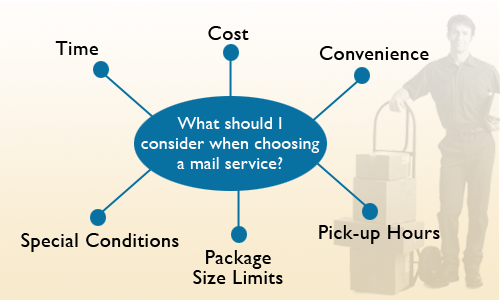 A simple alternative to a list is to place each item into a a text box that is arranged in a suitable layout. With this approach, each point is more pronounced than in a list. It can also be accomplished easily with basic graphic tools and in PowerPoint. 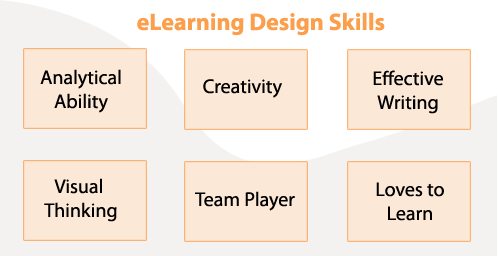 Below, what could have been a bullet list of eLearning design skills is placed in horizontally arranged text boxes with a 1 pixel border. Using the same text boxes as above, this approach adds icons to the words. Notice the appealing effect of adding small and simple pictures to each box. For some learners, the image may work as a mnemonic device to help retain information. In case you’re wondering where to find icons, check my Icon Collections page in Resources for suggestions. These icons were found at Iconfinder. You can take this approach one step further by accentuating the graphic more than the words. 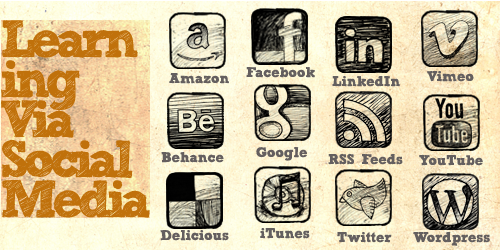 In the social learning screen below, graphic prominence through size is appropriate because of the well-known branding of the platforms shown. The Sketch Block font is free for personal use from Dafont.com. When you use people cutouts to speak your points, no one will suspect this is a list. When you buy people cutouts, you get the same person in various poses. 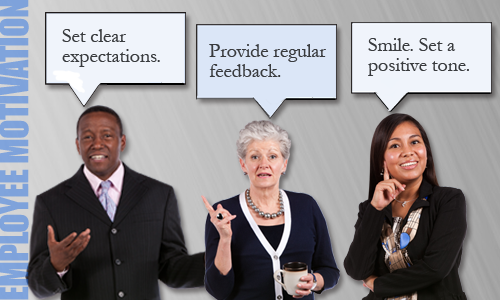 You can use these as instructional-agents or as characters in scenarios throughout the course. 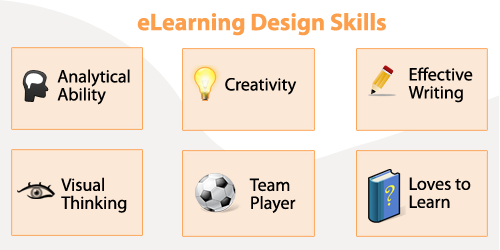 You can find cutout people at eLearning Art and the eLearning Brothers. These cutout people are from the eLearning Brothers. The speech bubbles are a free download from Media Militia. Another simple approach is to find an interesting silhouette at a stock photo site or even to draw a simple geometric shape. Then wrap the list around the silhouette or shape, gently following its contours. Then there’s the diagram approach. Use a radial diagram when information is at the same level. Place the topic or category in a circle or ellipse in the center. Then place spokes around this shape in the form of arrows or pointers. Place what would have been a bullet list item at the end of each spoke. For alternatives to the mind map approach, use a hierarchical chart when list items supersede each other. Also experiment with other graphic formats or with PowerPoint’s predefined diagrams. Just remember to use grouping principles so learners will know which items are related to each other. If you analyze your content carefully, you might find that several bullet lists can be associated into one category. If so, then the lists can often be combined into one table. The wondrous thing about a table format is that the values can be either words or numbers. 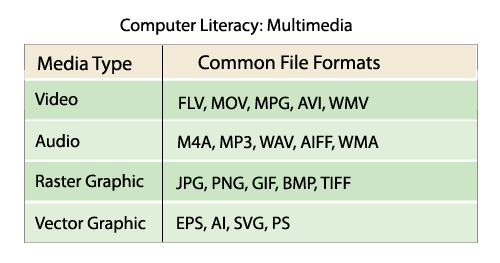 In the computer literacy example below, different multimedia file formats (on the right) are organized into a table by media type (on the left) rather than using four separate bullet lists. What do you use as alternatives to bullet lists? Comment below. 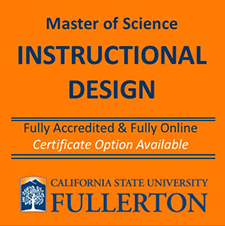 Join me on Facebook for more about eLearning, graphics and instructional design. plus a Visual Design Checklist. I have been trying to “ban the bullets” with clients recently, this is a nice set of alternatives – all simple and easy to explain. Thanks, Bruce. Glad this helps. I still use bullets myself, but try to mix it up with these types of approaches. I will keep your examples also and put it in my best practices if you don’t mind (with mentioning you of course!). It will add credit to my speech if there is some English experts saying what i repeat every single day. Thanks for your always “just in time” posts. Thanks for your comment. I’m sure it’s quite satisfying for you to improve your SMEs’ presentations. I’m guessing that their use of the word “NICE” means a lot more than that. It’s just a simple way to express the richness that you’re adding. 🙂 Keep up the good work! Really like the way you work around the dreaded list. Really like this post. As a teacher in school it is important to keep content fresh and engaging, and moving away from dry bullet points is a fast, easy and practical way to do that. Thanks, Mark. So happy this is helpful. Teachers need all the help they can get. This is a great set of options! Here’s a video showing how to create your own set of icons so they look good together. I like your ideas. Specifically, I like the “Let the icons do the talking” since it takes advantage of the metacognitive study strategies of mnemonics and visual imagery. Please keep bringing the good ideas, thanks for an excellent coaching. I agree, Jose. Icons can be leveraged so that they facilitate learning. Thanks for your comment. 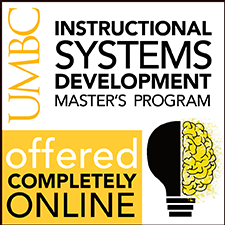 Fantastic information and ideas – thank you!! Excellent idea! Will share with all Trainers in Indonesia. Thank you! Great article – creative alternatives – love it! Very good ideas. I usually use the nos 1, 2 and 5 ideas. Will now look for an opportunity to apply others. Bullet lists are quite cliched now-a-days, but at times, we can’t simply do away with them. This will help. Thanks for posting! These look great, were very inspirational and got me thinking of more ways to do this! I really like #4, which supports a list with items that contain more than a few words. I’ll try it out. I just discovered your blog via School Library Media Activities Monthly. You have blown up my PPT presentations in my middle school library! I’m not a very creative person, so your suggestions made me see how dynamic a PPT can be. I can’t wait to share these ideas with our 8th grade students, who do about 4 PPTs a year in history class. Their presentations fall into two camps–dry bullet pointed lists of information, or chaotic slides crammed with every transition and animation PowerPoint offers. Our teachers will be thanking you, too, as they wade through 150 PPTs each quarter. I’m glad I am back at work 2 weeks before the students so I can work my way through your blog and website to educate myself on design! Thanks for sharing your insights. I love these ideas and have used a few of them in my own design. However, I think we also should remember what I just learned in a statistics class, which is that you need to make sure the graphic doesn’t pull away from or interfere with either the relevance of meaning of the information being presented. For example, I love infographics, but if you look at some of them, the ratio of the pictures they use to display the information isn’t the least bit accurate. Obviously, it’s probably easier to confuse numerical data than it is when trying to simply display words to be interpreted, but still, at times a graphic might be interpreted to mean something with regard to the content that it is not meant to, so it’s good to keep that in mind. Such simple yet innovative and amazing tips….thank you. These will really bring substantial improvement to my presentations. Also, bullets help to organize the information in a way the alternatives can’t do quite as well. 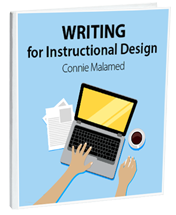 Mixing it up keeps the participant “awake”…using styles appropriately helps them to retain the content. TX for the good ideas! Just saw this post via Scoop.it. Great ideas, thanks! great article! I wish all the people read it and stop using bullets all the time.. I am glad to see your article as one of my readings in my EdTech course. Thanks for your support. It’s not always easy to get around using bullet points, but it’s good to try (unless they are really needed). Very nice article, useful, succinct, to the point. Thanks for sharing! What a great list of alternatives, Connie – thank you. I knew or could name all of thsoe but hadn’t really thought about using them more than bullet lists when I help clients with presentations. I do use tables a lot as well as lists with an image but you’ve reminded me to mix things up further. I’m glad you found it helpful, Tash. I’d love to hear other suggestions. I’m sure there could be many more. Great post, Connie! This list is really accessible and useful because you’ve illustrated each idea and described them succinctly, yet also supplied links to more resources. Coming from a tech-writing background myself, I find tables really valuable, too, which might explain why I use them quite a lot in my posts! Anyway, thanks for all the neat ideas here. Thanks for all of your ideas and links. I love when readers share what they know. What a great community. I enjoyed reading your article, especially Alternative 3: Let People Speak Your List. While I have utilized the other techniques in my own PowerPoint presentations, this will be a useful addition to my slides. 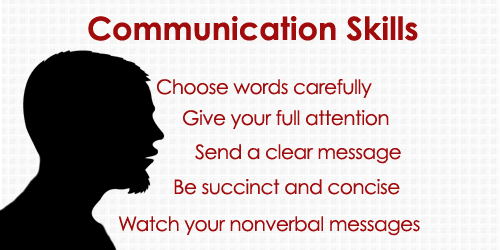 Use a blank slide (‘B’ ow ‘W’) and use your own voice, visibly counting on your fingers each point you make. Thanks for the excellent suggestion, Edward. This would work well with a professional narrator and with captions too. Always a reference for me to get rid of bullets. Thanks for the kind words, Belen. Glad it helps! These are awesome ideas. Thanks for sharing. I just found out recently you are doing a podcast. I been going through and listening to all of them. Great Stuff! Thanks, Aaron. Hope you enjoy the podcast. These alternatives look great. Remember though that most would need alternative text versions to meet accessibility standards. Thank you for the alternative text reminder! How unbelievably refreshing to see this combination of imagination and practicality. Thanks, Connie. Thank you! I have a section about this topic in my new book too (Visual Design Solutions), though it might be similar examples (I can’t remember, LOL). I am a pastor and am trying to communicate more than 10 characteristics of God. I can just see the eyes glaze over. I imagined a graphic of some kind being a better approach than a list as long as your arm. I like the graphic you suggested above. How many satellite points can I use before they miss everything? Maybe five? People can process around 3-5 chunks of information at one time. Nicely done. More creative and visually attractive which is what we need. Great alternatives to the dreaded bullet list! Thanks for this insightful article and highly effective tips. Another top post, Connie. I’m relatively new to your site, and just catching up on “arrears” of your great ideas! Like Craig Hadden, I favour displaying one item at a time in presentations and webinars – using “build ups”. The easiest way to make this look seamless is to create the final slide in the series first – and then copy this as many times as necessary and delete text boxes from the earlier ones in the series as necessary. So: create slide 6 with 6 text boxes and copy it so you have 6 copies. Then delete text boxes 2 to 5 from slide 1 (leaving box 1) – delete text boxes 3 to 5 from slide 2 (leaving boxes 1 and 2) – and so on until you build up to slide 6. I find this works really well if I “highlight” the current point being discussed by the narrator. Usually, I keep the relevant text box in full colour, and fade the previous text boxes using transparencies. Yes, that’s a good approach. Glad you are sharing it.